The German Flag was adopted as the national flag in 1919 and features three horizontal bands with the colors, black, red, and gold. There are many different meanings and interpretations of the colors that are used on the flag. The black and gold colors are thought to be used as they are the same colors on the coat of arms of the Roman Empire (Germany was part of the Roman Empire until 1806). The colors of the German flag were also the colors that were worn by the German soldiers during the Napoleonic Wars as their uniforms were black coats with red braids and gold buttons. It is also claimed that following World War I, the colors of the flag represented the "Centrist, Republican and Democratic" political parties. 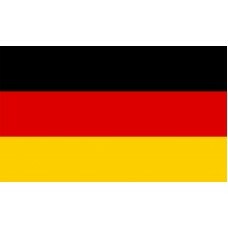 The German Flag, seen as a whole, represents the unity of Germany and the people, but the colors separately represent, generosity (gold color), bravery and strength (red color), and determination (black color). 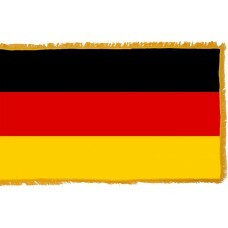 The current flag that is used today, was first used in 1848 as the German flag. In 1871, when Bismarck (Prussian Prime Minister) took control of the country, the flag was changed but re-adopted again in 1919 when Germany became a republic. In 1933, the flag was changed once again following the takeover of Germany by the Nazis and was re-instated in 1949, following World War II. Germany is a country in Central Europe that shares borders with Denmark, Poland, Czech Republic, Austria, Switzerland, France, Luxembourg, Belgium, and the Netherlands. The capital city of Germany is Berlin. It is a country that has much history and endured many wars and troubles. During the very early years of Germany (formerly known as Germania), it was a country that consisted of small states that were ruled by Kings. In 1618, following the "Thirty Years War," it was divided into Bavaria, Saxony, and Prussia. In 1815, after the Napoleonic Wars, Germany became a very successful country and grew, resulting in its unity in 1871. In 1914-1918, during World War I, Germany fought against Great Britain, Russia, France and America but they were defeated which led to the German Monarchy being demolished. In the 1930s, during the Great Depression, Germany was no longer a successful country as the economy suffered majorly and by 1933, six million people in Germany were unemployed. In 1933, when Hitler gained power, he promised to make Germany the successful and great country that it was before and established his first concentration camps in Germany before and during World War II. World War II ended in 1945, and, as part of a settlement with the Soviet Union, Germany was divided into two countries, "East Germany" and "West Germany" and the two countries were not united until 1990, following the Cold War. Germany now, despite its history and many tragic wars, is the largest economy in Europe and is also the second most populated European country.